Positron emission tomography (PET) scans are used to produce detailed 3-dimensional images of the inside of the body. PET imaging in hematology has become a cornerstone procedure which is particularly helpful for investigating confirmed cases of cancer to determine how far cancer has spread and how well it’s responding to treatment. A PET scan can show how well certain parts of the body are working, rather than simply showing what they look like. The images can clearly show the part of the body being investigated, including any abnormal areas, and can highlight how well certain functions of the body are working. PET scans are often combined with CT scans to produce even more detailed images. This is known as a PET-CT scan. PET-CT scans are generally thought to be more accurate in diagnosing cancer than PET scans alone. With modern dedicated PET machines, a resolution of approximately 5 mm can be achieved. Moreover, using a quantitative approach to interpretation with the standardized uptake value (SUV) (ratio of activity per volume unit over injected activity per body mass), PET imaging is more precise than conventional scintigraphy. stage cancer, so doctors know whether it has spread. decide whether you can have surgery to remove your cancer. decide which is the best treatment for your cancer. find the place in the body where your cancer first started to grow (primary cancer). check whether your cancer has come back. PET scans may also occasionally be combined with an MRI scan (known as a PET-MRI scan). 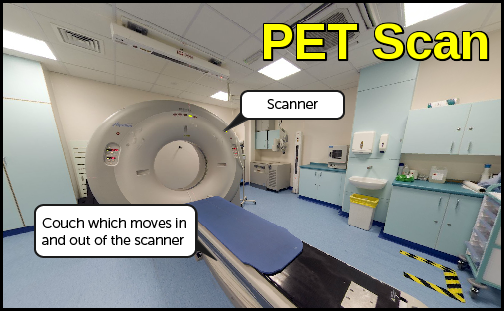 PET scanners work by detecting the radiation given off by a substance injected into the arm called a radiotracer as it collects in different parts of the body. In most PET scans a radiotracer called fluorodeoxyglucose (FDG) is used, which is similar to naturally occurring glucose so the body treats it in a similar way. By analysing the areas where the radiotracer does and doesn’t build up, it’s possible to work out how well certain body functions are working and identify any abnormalities. For example, a concentration of FDG in the body’s tissues can help identify cancerous cells because cancer cells use glucose at a much faster rate than normal cells. The adoption of the PET scan has been most notable in the treatment of lymphomas where its incorporation into the care of Hodgkin’s and non-Hodgkin’s lymphomas is now virtually universal. PET scans have clearly impacted the way lymphomas are staged and treated, particularly those types with the potential for cure, such as classical Hodgkin’s lymphoma and large cell and/or aggressive lymphoma. PET scans, because of their enhanced sensitivity and convenience, have almost totally replaced gallium scans. Unlike gallium scans, PET scans are routinely used in staging since the scans are able to reveal disease in normal-sized lymph nodes (on CT scan) which would otherwise have been interpreted as unremarkable. PET scanning has altered treatment approaches as well. For instance, bulky masses, despite being sterilized of lymphoma, are often characterized by some residual mass or scar. Using conventional means, it has been difficult to determine whether the residual mass after treatment did or did not contain active disease. As a result, these masses had been routinely irradiated even if a biopsy showed scar (because of possible sampling error). Although many still advocate irradiating bulky masses, the advent of the PET scan has engendered a rethinking of this approach when no disease activity is apparent. Staging has an important role in the treatment of all malignancies but is critically important for patients with lymphoma. Accurate staging allows minimization of toxic therapies, such as extended-field radiation or overly aggressive chemotherapy, decreasing the risk of secondary malignancies, which exceeds 10% in several historical series of patients with early-stage Hodgkin’s disease. Patient quality of life during and after treatment may also be improved with tailored therapy defined by staging. Most studies of PET involve patients with either Hodgkin’s disease or diffuse large B-cell non-Hodgkin’s lymphoma. 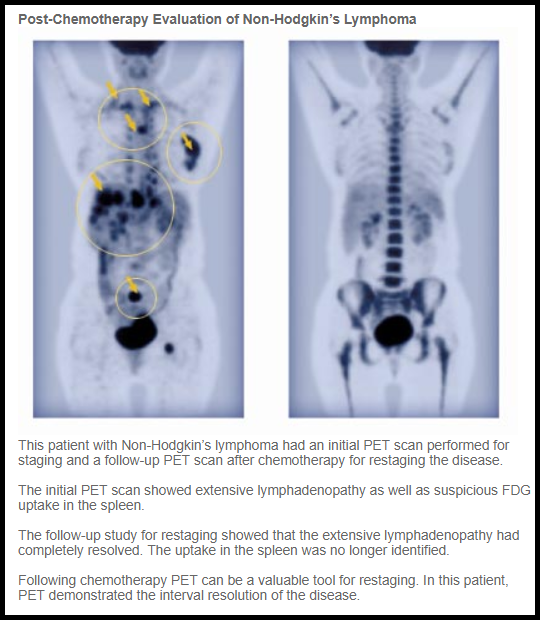 PET detects more disease sites above and below the diaphragm on staging of lymphoma than gallium scintigraphy and may have particular utility in the evaluation of the spleen. Perhaps more importantly, PET may help to characterize a residual mass on anatomic imaging following therapy as either fibrosis or residual active lymphoma. Moreover, persistently positive PET scans during and after chemotherapy appear to have a high sensitivity for predicting subsequent relapse. A negative PET scan at the end of therapy provides very favorable prognostic information. The majority of studies evaluating FDG-PET in lymphoma include patients with diffuse large B-cell non-Hodgkin’s lymphoma (NHL) or Hodgkin’s disease. There are limited data available on the role of PET in other histologies. A retrospective review of 172 patients with various types of lymphoma who underwent FDG-PET imaging was completed at the University of Pennsylvania. Only 6% of those patients had no evidence of disease on PET scans. FDG-PET accurately detected disease in patients with diffuse large B-cell NHL, mantle cell lymphoma, follicular lymphoma, and Hodgkin’s disease. PET was less reliable at detecting marginal zone lymphoma, a finding that has been confirmed by other groups, particularly in the case of extranodal marginal zone lymphomas. In another study, limited to patients with indolent B-cell lymphomas, PET appeared to have potential to contribute to the management of patients with follicular NHL, but sites of disease in patients with small lymphocytic lymphomas were only detected approximately 50% of the time. Small series have suggested that, using SUV to determine intensity of FDG uptake, PET may be able to predict histologic transformation of indolent lymphoma; however, the relationship among pathological subtype, mitotic rate, and SUV remains controversial. Score 1: No uptake above the background. Score 2: Uptake ≤ mediastinum. Score 3: Uptake > mediastinum but ≤ liver. Score 4: Uptake moderately increased compared to the liver at any site. Score 5: Uptake markedly increased compared to the liver at any site. Score X: New areas of uptake unlikely to be related to lymphoma. Thompson CJ. Instrumentation. In: Principles and Practice of Positron Emission Tomography.Wahl RL (Ed.). Lippincott Williams & Wilkins, PA, USA 48-64 (2002). 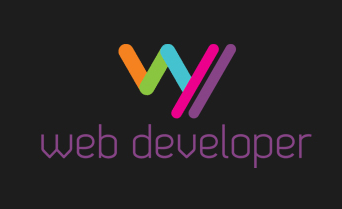 Ng AK, Bernardo MV, Weller E et al. Second malignancy after Hodgkin disease treated with radiation therapy with or without chemotherapy: long-term risks and risk factors. Blood 2002;100:1989–1996. Elstrom R, Guan L, Baker G et al. 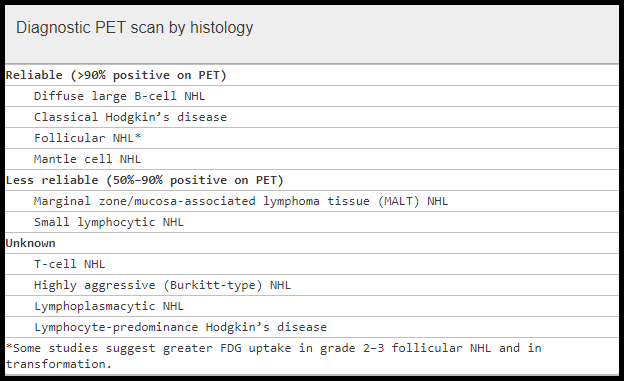 Utility of FDG-PET scanning in lymphoma by WHO classification. Blood 2003;101:3875–3876. Hoffmann M, Kletter K, Diemling M et al. Positron emission tomography with fluorine-18-2-fluoro-2-deoxy-D-glucose (F18-FDG) does not visualize extranodal B-cell lymphoma of the mucosa-associated lymphoid tissue (MALT)-type. Ann Oncol 1999;10:1185–1189. Jerusalem G, Beguin Y, Najjar F et al. Positron emission tomography (PET) with 18F-fluorodeoxyglucose (18F-FDG) for the staging of low-grade non-Hodgkin’s lymphoma (NHL). Ann Oncol 2001;12:825–830. Barrington et al., Eur J Nucl Med Mol Imaging (2010) 37:1824–1833. Follows et al, British Journal of Haematology, 2014, 166, 34–49.